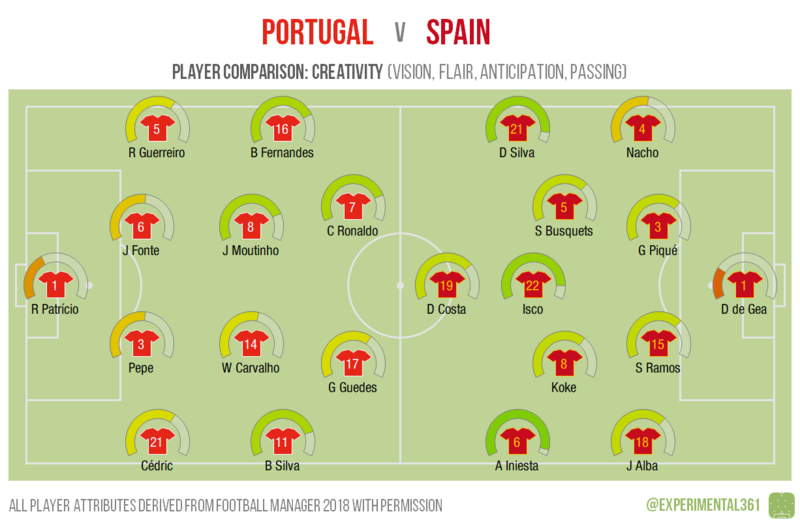 Following on from yesterday’s hurried post, here’s what the Football Manager 2018 data has to say about the line-ups for the biggest box office draw of the World Cup so far: Portugal v Spain. The explanation for this is in the link above, but in a nutshell I’ve treated the Football Manager database like a scouting tool and scored the two teams by combining their in-game attributes. There’s probably less mystery around this one than the others, as there are plenty of household names, so I’ll keep this one a bit shorter. 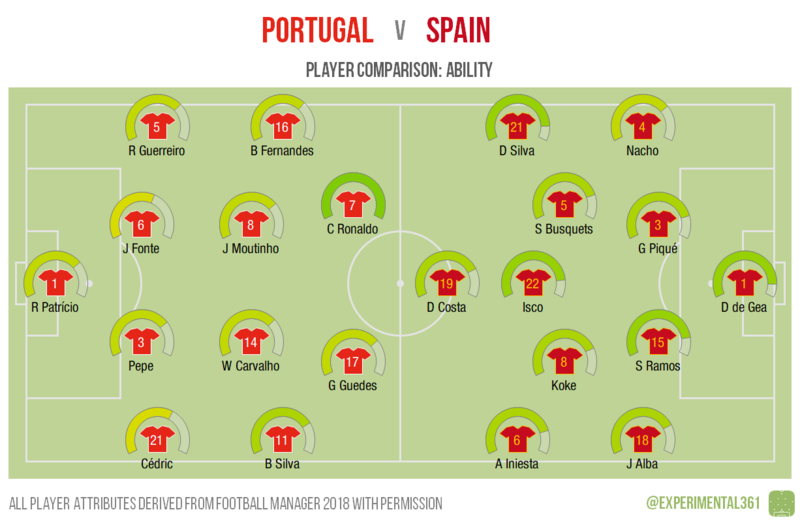 Spain are “greener” overall, with the Portuguese defence in particular looking like a relative weak point, but they do have the peerless Ronaldo playing in front of them. Both teams have a mixture of mobile and somewhat more cumbersome players: Fonte and Carvalho fit the latter profile for Portugal while the ageing Iniesta isn’t going to be darting about quite as much as he used to for Spain. Both teams look slower through the centre than out wide, with each boasting pretty mobile full backs. As you’d expect, Ronaldo is world class here too, with his opposite number Diego Costa a little way off. Sergio Ramos also ranks well for Spain thanks to his heading ability, but both sides have a respectable number of threats in their ranks if their main men misfire. As expected, there are plenty of players on both teams who can create something out of nothing. 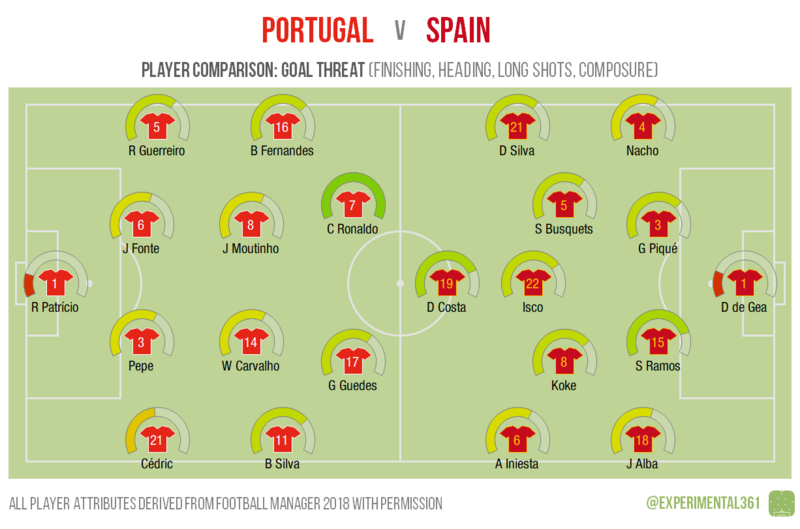 The three attacking midfielders lining up for Spain – particularly the legendary Iniesta – are probably the best combination in the business, but Portugal’s are no slouches themselves. The Portuguese do look slightly less creative as a unit however. 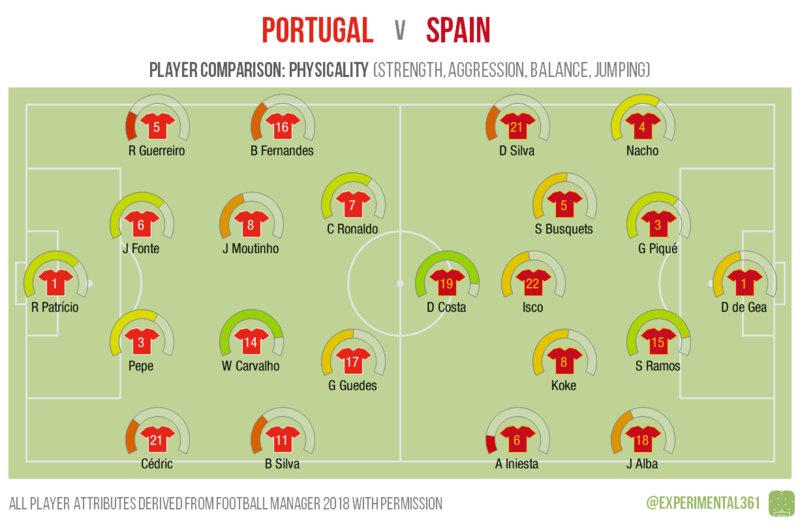 Diego Costa unsurprisingly stands out as being a bit of a handful – as does Sergio Ramos – so it looks like William Carvalho may need to put himself about a bit to prevent the Portuguese defence from being bullied.